Part of a recent vacation included a quick fabric shopping stop in the LA Garment District. Its overwhelming, its insane, its amazing. For seamstresses out there who have never taken a trip into the biggest textile center in the United States, this is a must-see! When I visited it was a Sunday, where only 1/3 of the shops were open: and it was still insane. With that in mind, check out the LA Fashion District website for the map, but make sure to read these tips first before you wander in there for your next sewing project! Some of the shops take card- but many do not. Save yourself the trouble of having to turn down an awesome print for your next novelty skirt because you’re carrying plastic. 40$ is more than enough for wholesale fabric prices, and 60$ could take you over the moon. 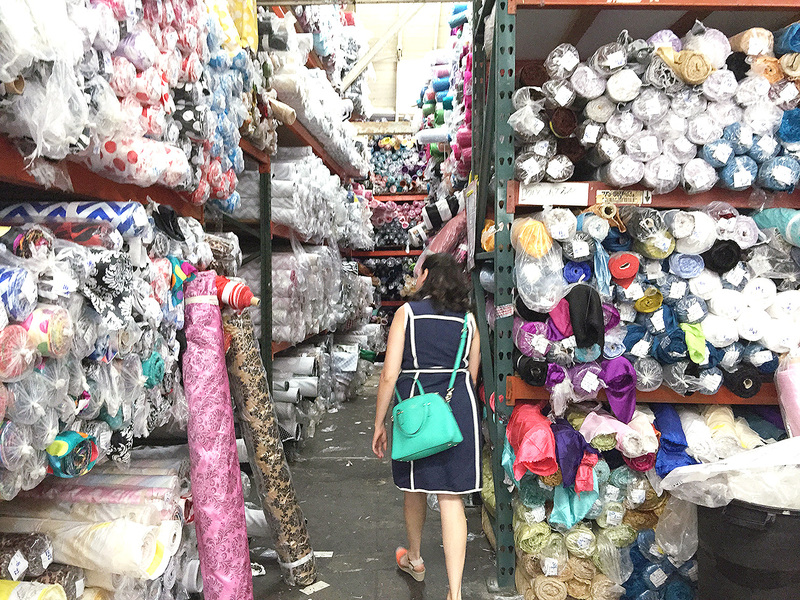 One of the most amazing things about the LA garment district is its proximity to many sewing businesses that are working on garments hitting sales floors around the country. When a company finishes up a run for whatever brand, what happens to the leftover fabric scraps? They land at the garment district, being sold off as-is. You can find warehouses literally filled with fabric in various states: half yard pieces, full yards with a single sleeve cut out, remnants. These get thrown into a box and taken to the garment district to be gotten rid of. I found great fabrics to make blouses for a dollar a yard- didn’t matter the textile brand, fiber content, or print. These warehouses just need the fabric to go so take the opportunity and go crazy here. Don’t hesitate! Even though the fabric is all ready at wholesale discount, the shop keepers want to make a sale and move product- so don’t be shy about it. Also, some of the most basic fabric can be found at other shops in the area so be aware that you can probably get a better price elsewhere- and that’s something you can also tell the shop keeper: “I saw this down the street for a dollar less. Can you match it?” As with most haggling, be willing to walk away from the fabric, too. If you’re looking for something specific, you might not find it– but you you’ll find something more amazing instead. Remember that the LA garment district is wholesale, supplying sewing warehouses in Southern California and beyond. They have amazing product from all over the world- you never know what you’re going to stumble into and fall in love with. Imagine walking into a store dedicated to nothing but Pacific Islander prints– or another that is nothing but laces. Your eyes will have a feast looking at everything and imagining the possibilities. When you visit, remember that you might not find the right polka dot- but just go with it, you might find a fun herringbone instead. Have any tips from your trip to the LA Garment District? Leave them in the comments below! I am visiting family in the LA area in a couple months’ time and want to sneak over to the garment district for some fabric hunting… Although I don’t think “sneaking” will work as it looks like it would take me about a million years to get through any of these shops. Great tips- I’ll keep them in mind! Thanks so much for your comment! The garment district really can be quite overwhelming, but just go in with an open mind and let the fabric speak to you! Have fun!